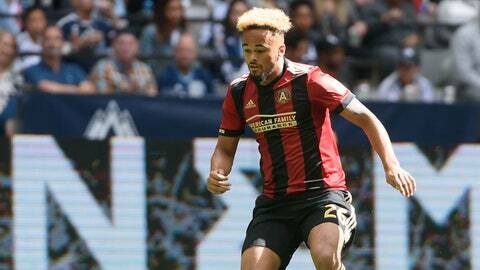 Anton Walkes is on a season-long loan with Atlanta United from Tottenham Hotspur. ATLANTA — You know the tune Uber Eveywhere? Well, Atlanta United defender Anton Walkes makes the infamous MadeinTYO song a reality. He lives in close proximity to the training facility and Ubers wherever he may need to travel. Maneuvering around seems to work out nicely for Walkes, but Ubering home, his native home – in Lewisham, England – may be bit of a stretch for the 20-year-old. The Englishman is being loaned to Atlanta United by way of the Tottenham Hotspur in the English Premier League. His journey with Atlanta hasn’t been simplified to competing in front of large crowds, rolling deep into Bobby Dodd stadium. Rather, its identical to that of studying abroad for a semester in higher education. Head coach Gerardo “Tata” Martino is his designated professor. Walkes is with the Atlanta United squad to grow and develop his skills in order to become better equipped for the Spurs upon his return… For now. His term began on Jan. 26 and runs until the end of the MLS season in respect of his contract. It’s not the easiest of courses, but it pleases Martino to an extent that through the frustrating loses there is a silver-lining with younger players like Walkes. The hardworking youth foreshadows what the future holds for Atlanta United. The 6-foot-2 center back claimed an own goal in his first appearance for Atlanta United in its first regular season game. It resulted in a 2-1 defeat against the New York Red Bulls. Walkes appeared ball watching instead of following his man all the way through the play. For Walkes to correct any shortcomings is, obviously, to gain more time on the field. His first start came against the Charleston Battery in the first round of the U.S. Lamar Hunt Open Cup, where he helped the team win 3-2. Fast forward to the next round where Atlanta United dropped a 3-2 decision to Miami FC. Martino elected to use Walkes services, starting at center back. Up until this point, Walkes has notched five total appearances for his current club. Center back is where Walkes predominantly resides on the backline. However, Atlanta United used him as a right-back in the Five Stripes 1-0 win over Colorado. He tallied a full 90-minute period, but it isn’t anything out of the ordinary for Walkes. Walkes saw some time at the outside back position with the Spurs Under-18s. There he received playing time in the Premier League 2 division, amassing 12 appearances, as well as the UEFA Youth League. He also accumulated one first team appearance for the Spurs in the final 10-minutes of a 5-0 EFL Cup win against Gillingham. Moreover, Walkes made appearances in preseason contests against both Juventus and Atlético Madrid as part of the International Champions Cup in Melbourne, Australia. Walkes earned the nod at center in the matchup versus Madrid. It’s even known that Walkes has the ability to push into a defensive midfield position. If Atlanta United should decide to experiment with the lineup or fancy the youngster at that spot, he’s available. Nonetheless, it doesn’t matter what position Atlanta put Walkes. It’s only a matter of strengthening the defense and growing into that role. Before the Spurs front office come calling, the opportunity is deemed as something special. The Spurs aren’t too far from Walkes either as he remains in touch with coaches. Being on loan, Walkes is monitored by the Spurs front office in regards to his progress with Atlanta United. The Spurs offered critique to their potential, future star in the making when he made the start at right back against Colorado. His home base concurred that his rotation around the back adds to his maturation. Walkes continues to be tested and when his season-long loan comes to a close, he’ll either walk or perhaps extend his stay to prep some more. Either way, Martino and Atlanta United are just making the most of it.